Bootsy Collins Opens "Funk University"
NEW YORK (CBS) Bootsy Collins is fed up with young people not knowing the history of funk music - and he's doing something about it. The bassist for James Brown in the early '70s and then George Clinton's Parliament-Funkadelic through 1980 is opening his own school of higher learning -- Funk University, an online bass guitar school he is co-creating with actor-entrepreneur Cory Danziger. 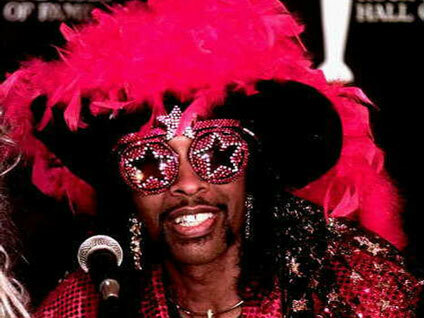 "The state of funk today is kind of funked up," Collins told ABC News in a report published Monday. "If you say anything about those old musicians to youngsters today, most of them don't have a clue," he continued. "All they know is who their favorite bass player or guitarist is now. They have no idea how to connect those dots, where this style or this music comes from." Students can enroll beginning July 1. Collins' course work will include lectures on funk and bass. Guest lecturers will include Flea (of the Red Hot Chili Peppers), John B. Williams, Les Claypool and Victor Wooten. Funk U. undergrads will be provided with online lessons, and staff will periodically review students' performances. In time, Collins says, the school may expand to include other musical genres. "It's about music," he said. "Because I play bass, we have to start there. Because I'm known for funk, we have to start with that. But it's really about the whole adventure of music. We want to embrace everything that has something to do with music and creating."